A binary operation on a set of integers is defined as x y = x2 + y2. Which one of the following statements is TRUE about ? Associativity: A binary operation ∗ on a set S is said to be associative if it satisfies the associative law: a ∗ (b ∗c) = (a ∗b) ∗c for all a, b, c ∈S. Commutativity: A binary operation ∗ on a set S is said to be commutative if it satisfies the condition: a ∗b=b ∗a for all a, b, ∈S. In this case, the order in which elements are combined does not matter. Solution: Here a binary operation on a set of integers is defined as x⊕ y = x2 + y2. for Commutativity: x ⊕y= y ⊕x. LHS=> x ⊕y= x^2+ y^2 RHS=> y ⊕x= y^2+x^2 LHS = RHS. hence commutative. for Associativity: x ⊕ (y ⊕ z) =(x ⊕ y) ⊕ z LHS=> x ⊕ (y⊕ z) = x ⊕ ( y^2+z^2)= x^2+(y^2+z^2)^2 RHS=> (x ⊕y) ⊕z= ( x^2+y^2) ⊕z=(x^2+y^2)^2+z^2 So, LHS ≠ RHS, hence not associative. Reference: http://faculty.atu.edu/mfinan/4033/absalg3.pdf This solution is contributed by Nitika Bansal Another Solution : commutative as x y is always same as y x. is not associative as (x y) z is (x^2 + y^2)^2 + z^2, but x (y z) is x^2 + (y^2 + z^2)^2. This solution is contributed by Anil Saikrishna Devarasetty . 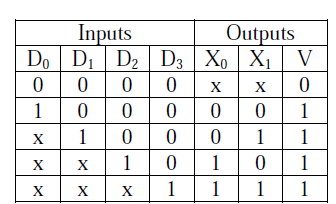 In the following truth table, V = 1 if and only if the input is valid. What function does the truth table represent? Since there are more than one outputs and number of outputs is less than inputs, it is a Priority encoder V=1 when input is valid and for priority encoder it checks first high bit encountered. Except all are having at least one bit high and ‘x’ represents the “don’t care” as we have found a high bit already. So answer is (A). Which one of the following is the tightest upper bound that represents the number of swaps required to sort n numbers using selection sort? Which one of the following is the tightest upper bound that represents the time complexity of inserting an object into a binary search tree of n nodes? To insert an element, we need to search for its place first. The search operation may take O(n) for a skewed tree like following. To insert 50, we will have to traverse all nodes. What is the maximum number of reduce moves that can be taken by a bottom-up parser for a grammar with no epsilon- and unit-production (i.e., of type A -> є and A -> a) to parse a string with n tokens? Hence 2 reductions. But we are interested in knowing the maximum number of reductions which comes from the 1st grammar. Hence total 3 reductions as maximum, which is ( n - 1) as n = 4 here. Thus, Option B. A scheduling algorithm assigns priority proportional to the waiting time of a process. Every process starts with priority zero (the lowest priority). The scheduler re-evaluates the process priorities every T time units and decides the next process to schedule. Which one of the following is TRUE if the processes have no I/O operations and all arrive at time zero? This algorithm is equivalent to the round-robin algorithm. This algorithm is equivalent to the shortest-job-first algorithm.. The scheduling algorithm works as round robin with quantum time equals to T. After a process's turn comes and it has executed for T units, its waiting time becomes least and its turn comes again after every other process has got the token for T units. The answer can be easily guessed with XML. XML is used for information representation.